Welcome to Wayback Wednesday, your midweek blast from the past! This is a feature where we look back on yesteryear, dig into the archives, indulge in some nostalgia, and in some cases, wonder just what we were thinking. Check in every Wednesday for features and retrospectives on old basketball video games, old NLSC editorials published as-is with added commentary, and other flashback content. Throughout the history of video games, most titles have had a secret or two to discover. Of course, for as long as gamers have been searching for hidden secrets and extra content, urban legends and hoaxes have also been making the rounds, leading to many wasted hours looking for something that isn’t there. 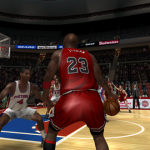 Basketball games are no exception, and the fact that some games have featured hidden and unlockable content has naturally led to rumours of all sorts of secret players, teams, and other features, none of which were actually true. Outside of a supposed hidden and unlockable dunk contest, one of the most popular rumours in NBA Live over the years was that by completing certain objectives, you could unlock historical teams. Of course, to include historical teams in the first place, EA Sports would need to secure the likeness rights for a lot of players. 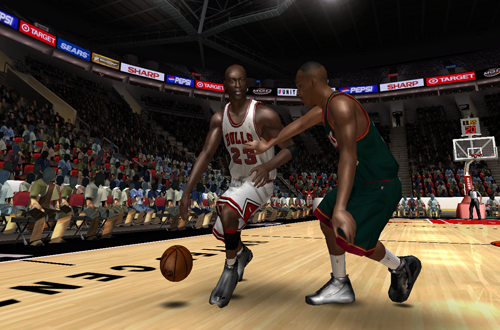 As such, retro teams didn’t become a reality until 2K Sports finally added them in NBA 2K11 via the Jordan Challenge, and they’ve managed to keep a bulk of their historical content in the game up until today. 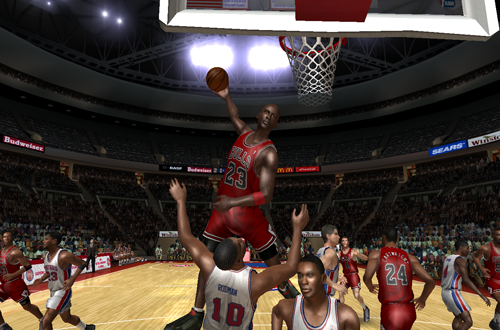 However, it appears that EA Sports was actually trying to do something similar, back in the days of NBA Live 08. 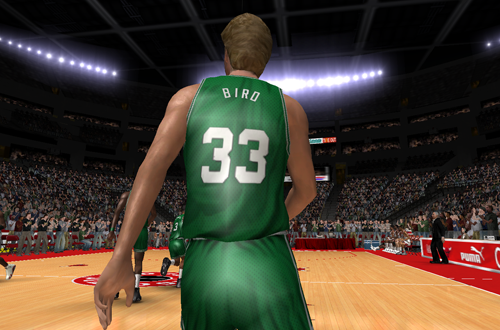 If you go looking through NBA Live 08’s players.dbf file – the players database, as the name would imply – you’ll find entries for a handful of historical teams. Although they’re missing a player here and there, usually from the deep bench, they’re more or less complete. It was quite exciting when we found those entries, but our enthusiasm quickly dwindled when we opened up teams.dbf – the teams database – and couldn’t find any data for the teams those players were supposedly assigned to. Furthermore, when we opened up the art files, there were no assets for any of those teams or players. It was clearly leftover data from a feature that ultimately fell through. Still, the discovery led to some interesting conversation and speculation. Clearly, there had been plans to include a few historical teams in NBA Live 08 at one point, and they were presumably scrapped due to an inability to license all the necessary players. Considering that NBA Live 08 included eight FIBA teams and EA confirmed that it was due to the fact they acquired the FIBA license late in development, it seems quite possible that they were actually a backup plan. If so, one has to wonder how close historical teams came to being a reality in NBA Live 08, and at what point they were scrapped during development. The fact that there were apparently going to be ten historical teams, and NBA Live 08 instead ended up with eight FIBA teams, certainly lends credibility to the suggestion that they were a backup plan when the retro squads had to be cut. Glancing at the player ratings, it appears as though they were far from finalised, as quite a few players are underrated. For example, based on Michael Jordan and Scottie Pippen’s ratings and bio info, it seems their data had just been copied across from their most recent appearances as active players in NBA Live (NBA Live 2003 and NBA Live 2005 respectively). As such, the teams were probably nixed fairly early on in development. Although there wasn’t much we could do with those championship teams out of the box, it did offer a head start in creating some historical content, and adding a few missing Legends to the game. Incidentally, if you’ve taken a look at the players.dbf files for the roster updates I was making for NBA Live 2005, NBA Live 06, and NBA Live 07 a few years ago, you’ll also find those players in there. That’s because I left them in there when I converted my NBA Live 08 roster updates for use with the older games; they were definitely not in the rosters before then. Speaking of looking for those players in the rosters for older games, that’s how those old rumours and hoaxes can be proven false. Take a look at the files for those games, and you’ll find no data or art assets for historical teams. If they were hidden and playable, the data and artwork would be there, as was the case with the Spanish national team in NBA Live 2004. Also, beyond the obvious need to secure likeness rights, historical teams are a big selling point, so there’s no reason to hide their presence if they’re going to be included. The same goes for the dunk contest, long rumoured to be a secret unlockable. When it was finally added in NBA Live 2005, it was heavily advertised, and rightfully so. It’s not a feature that you’d hide away. While NBA Live 08’s hidden historical teams have made for a fun trivia note and a couple of shortcuts in previously released patches, it seems a shame that we haven’t really done much more with that leftover data over the years. That’s one of the reasons I finally decided to give my Ultimate Jordan roster a try: it makes use of a couple of those teams in their entirety, as well as some other players who also played for teams I’ve added in the roster. It’d be nice if the data for those teams could also be used more directly, added to an historical roster complete and as-intended, with all the necessary artwork. For anyone who’d like to try out the Ultimate Jordan roster, I currently have a beta version available to download here. It’s a project that I’m working on whenever I can spare the time, and updating bit by bit with beta/demo releases. I’ll also look to convert it for use with NBA Live 2005, NBA Live 06, and NBA Live 07, when it reaches version 1.0. When it comes to the leftover data for those ten cut historical teams, it remains one of the more interesting and useful Easter Eggs in the NBA Live series. It also remains a big “what if” for NBA Live, especially seeing as how 2K Sports ended up signing Michael Jordan to an exclusive deal, and adding a large selection of historical teams to their game years later. Honestly, I’d love to get the full back story on what was planned for NBA Live 08, and when it all fell apart. Perhaps we’ll find out one day, but for now, I’ll just have to try and make use of that data as best I can, in unofficial add-ons. I was some young in Live 08 times and when I have reading NLSC I have hearing about legends entries in .dbf 08\’s files. Today, it\’s a marketing and money goal to restrict their catalogue of signed stars in LUT, why is it worse to compose them in 50\’–00\’ All-Star teams like we have been liking? I’d definitely like to see NBA Live do more with its historical players again. I think it’s more the fact that it’s difficult to compete with what NBA 2K is doing with their historical content, but I would like to see the return of the Decade All-Stars and stuff like that. Unfortunately, difficulty in securing likeness rights will always make it difficult to include complete teams. It’s a little surprising that 2K added some of the teams they did, though, considering they couldn’t secure the rights to some of the most prominent players.